This dark world must see evidence of Light in His children if they are ever going to know the true Light. 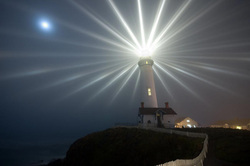 The first part of the commission above is "...to open their eyes, in order to turn them..."
If we have "seen the light", it is our duty to shine for the glory of God, and to share the Light with blind souls. Marching in step with the Holy Spirit, and the Living Word of God, it is our task to testify in word, and demonstrate in deed, that God is still on the throne, and that man is ultimately accountable to Him. The world must see "what right looks like". Don't curse the darkness - light a candle. -- Anonymous Chinese proverb.